Along with the rest of Summit County, Frisco real estate has experienced a steady incline in appreciation since 1990. If you’re looking for a second home or an investment property, Frisco may be the place for you. Many of Frisco’s real estate owners are investors, or second home owners, however more than 30% of the property owners live right in Frisco. Frisco, Colorado has a central location within Summit County and continues to maintain a higher average sales price than even Breckenridge. Throughout the 1990’s Frisco saw promising appreciation and growth levels. In the early 2000’s the Frisco real estate market, unlike most other areas, saw average property sales rise anywhere from 4% – 17%. Other areas in Summit County flattened and dipped slightly after the September 11th tragedy. However, real estate in Frisco wasn’t impacted very much at all. In 2003 and 2004 Frisco saw price increases of around 5%. The Frisco real estate market took off again in 2005 with the average price increasing by 9%. In 2006 Frisco reached new appreciation heights of nearly 26%. These are dramatic numbers, considering during these two years the rest of the nation’s real estate markets suffered with a record number of homes in foreclosure and with extreme numbers of properties on the market for sale. It’s not difficult to explain why Frisco real estate sales have sustained such incredible levels of appreciation while other markets have declined. The reasons are abundant as to why Frisco has continued to grow. One being Summit County and Frisco are of course a niche for second home owners. With a simple commute from Denver, Colorado Springs, Fort Collins and other Front Range locations, Frisco is easy to get to for a short weekend getaway. It’s also easily accessed from the Denver and Colorado Springs airports. Another explanation for Frisco experiencing encouraging appreciation levels over the years is it continues to offer exciting lake, mountain, and ski properties for a great value. Unlike Aspen, Vail, Beaver Creek and Telluride, Frisco real estate proves to be “reasonably priced” and a great investment by many buyer’s standards and expectations. Come and view some properties soon. For more information, charts and graphs on Frisco real estate click here. 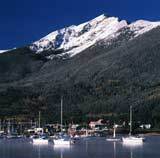 Founded in 1873, the Town of Frisco developed quickly due to the mining industry. Boasting two railroads, Frisco flourished with suceessful businesses including: hotels, saloons and several active mines. The population grew to over 250 by 1882. The mining boom ended in 1918 and along with the rest of the country, Frisco was hit by the Great Depression. By 1930, Frisco’s permanent population had dropped to only 18 people. Many of the smaller, less accessible mining communities were deserted, however, Frisco persevered and by 1946 the population was up to 50. Frisco remained a quiet little town with just a handful of summer visitors until Summit County’s second boom…the ski boom. Now with summer and winter activities, Frisco and Summit County play host to over 3 million visitors per year. Frisco’s 2,400 friendly full time residents love the central location and the authentic mountain lifestyle. Frisco is in the heart of Summit County and is a favorite to locals and tourist alike. It’s within minutes of seven major ski areas and is home to many charming restaurants, shops and motels which line its Main Street. The Town of Frisco has a full service marina with boat rentals where you can discover dramatic Gore Range and Ten Mile Range views along the 25 miles of forested shoreline around the Dillon Reservoir. The Frisco Nordic Center is another major attraction for snowshoers and cross country skiers, with its 35 kilometers of cross country trails at the town’s Peninsula Recreation Area. For more information on Frisco real estate contact Kelli today!